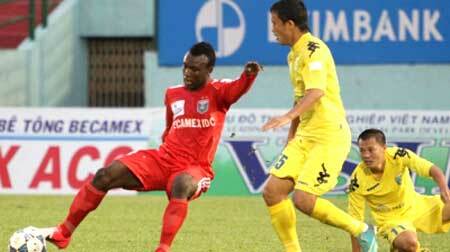 VietNamNet Bridge – The new season of the nation’s top tier football league, V-League 2014, is scheduled to take place from January 11 to August 31. The official dates and schedules for league matches were decided by the Vietnam Professional Football Company (VPF) at a meeting in Hanoi on November 21. V-League 2014 will feature competition from 13 teams: defending champions Hanoi T&T, Vicem Hai Phong, Song Lam Nghe An, Quang Ninh Coal, QNK Quang Nam, Thanh Hoa, XM The Vissai Ninh Binh, SHB Da Nang, Becamex Binh Duong, Hoang Anh Gia Lai, Dong Tam Long An, Dong Nai and HV An Giang. The National First Division Football Tournament will be held between March 15 and June 28, with the participation of eight clubs: Tay Ninh, Sanna Khanh Hoa, XSKT Can Tho, Ho Chi Minh City, Dak Lak, Thua Thien-Hue, Hanoi and TDCS Dong Thap. The teams will battle it out in a double round robin format, with matches at home and away, to decide the top scorers and overall champions. The new football season will open on January 4 with the 2013 Vietnamese Super Cup clash between reigning V-League champions Hanoi T&T and 2013 National Cup winners XM The Vissai Ninh Binh.